NASA's New Horizons spacecraft took this view of Pluto, combining blue, red and infrared images, during its flyby in 2015. An asphalt-like layer may be baking beneath Pluto's crust. Researchers are considering the possibility that the most famous dwarf planet may contain a layer of organic material beneath its surface heated into a thick, tar-like substance. The idea, which remains speculative, could affect scientists' understanding of how Pluto is built. Because Pluto was born in the icy Kuiper Belt beyond Neptune's orbit, it could contain organic material, particularly carbon, similar to that found in comets. If such a layer exists beneath the surface, heat and pressure could cook it into a thick, gooey material, said Bill McKinnon, a planetary scientist at Washington University in St. Louis, who presented the idea in December at the American Geophysical Union meeting in New Orleans. "It's not something that would be impossible inside the warmer parts of large, icy satellites and places like Pluto," McKinnon said. McKinnon stressed that this was an idea, not a confirmed finding. When presenting the idea, his goal was to bring the possibility of an organic layer to the attention of other scientists, in hopes of sparking further models and experiments that could investigate whether such a layer might exist within Pluto. Hot asphalt in the ocean? Exploring the layers of planets and other celestial bodies remains a challenge. On worlds like Earth and the moon, seismometers can track how long it takes waves generated by earthquakes to travel through the crust and mantle. Because the waves travel at different speeds depending on what material they are passing through, scientists can use these waves to determine the approximate makeup of the layers beneath the surface. The Apollo missions placed wave-tracking instruments on the moon, and NASA's Mars 2020 rover will carry one to the Red Planet. But for worlds without seismometers, researchers are stuck using the measured size and mass of the celestial body to calculate its density. They can then model various layers, usually of rock and ice, to determine the most likely layers of material. "The simplest thing to do is to assume it's made of rock and it's made of ice," McKinnon said. "It's either mixed together, or it's not mixed together, or it's halfway." These sorts of models, combined with New Horizons' observations of the ongoing geological activity on Pluto, suggest that the dwarf planet might hold a liquid or recently frozen ocean beneath its crust. McKinnon decided to take another look at the idea, however. He pointed to missions to visit comets, such as the European Space Agency's recent Rosetta mission and the decades-old Giotto mission, which visited Comet 67P/Churyumov-Gerasimenko and Halley's Comet, respectively. These missions and others have revealed that comets are rich in carbon, hydrogen, oxygen and nitrogen. "There's a lot of organic matter in comets," McKinnon said, referring to carbon-based compounds. Like Pluto, comets formed in the outer solar system. That led him to wonder if Pluto could have captured some of the same organic material when it was born. Earth contains a significant amount of carbon in its coal, peat and oil supplies. When prehistoric trees and plants died, they formed layers on the ground. Because the bacteria, fungi and other microbes that would have broken them down had not yet evolved, the once-living material didn't decompose like it would today. Instead, the weight of those layers converted them to peat and then, eventually, to coal. But that doesn't mean scientists are going to start looking for traces of forests on Pluto. While ancient life may be the source of the bulk of Earth's coal, it isn't the only way to produce the carbon-rich material. "It doesn't have to have an organic origin; it just has to come from ultimately organic matter," McKinnon said. If Pluto managed to store the organic material in its crust, heat and pressure could combine to cook out the more volatile components, leaving carbon behind. "Instead of having rock and ice, you might have rock and a massive organic layer — not just sort of a skein or a thin film, but something on the order of 100 kilometers [60 miles] thick or more," McKinnon said. That could change the current understanding of what is going on inside Pluto, and perhaps inside other icy satellites as well. "The stuff has interesting properties," McKinnon said. "If it's more like hot asphalt, it would be liquid and could transport heat very readily." On the other hand, a carbon layer could instead be solid, more like graphite, he said. "Graphite has tremendous thermal conductivity — much higher than any normal geological material like rock, or even cold ice." The presence of a more thermally conductive layer could affect the surface of Pluto, McKinnon said. 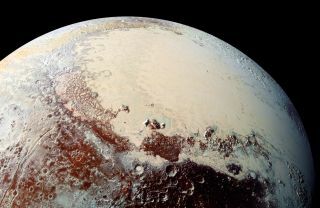 He pointed to Sputnik Planitia, part of the well-known "heart" of Pluto, saying that New Horizons revealed evidence of a dense layer beneath the lobe that lifted material upward. Previous research suggested that the layer could be a watery ocean. It's possible, however, that the dense layer could be uplifted organic matter, McKinnon said. The organic layer could stand alone, or augment a liquid ocean. McKinnon stressed that the idea remained purely speculative, brought up to encourage people to consider the potential. "It's a big plausibility argument to maybe get people thinking about this a little more, maybe trying to figure out ways to test it," he said.